Keyboards aren't always high on the list of considerations for folks buying a new computer or looking to upgrade an old one. Some may be more likely to splurge on a high-end monitor, or cram in as much RAM as possible. For this writer, though, the keyboard is one of the most important components of a computer, if not the most important. For the past 10 years or more, that's meant a split-design ergonomic keyboard in the vein of Microsoft's Natural Ergonomic Keyboard 4000 -- at least when not exclusively using a laptop. That style certainly takes some getting used to, and is always guaranteed to start a conversation, but it has some clear benefits for comfort (not to mention the well-being of your wrists) over the long term. More recently, however, that old standby has given way to a mechanical keyboard with a traditional design -- the Matias Tactile Pro 3, specifically. A split-design mechanical keyboard would be ideal, but those are unfortunately quite a rare breed. While a something like the Natural Ergonomic Keyboard 4000 has advantages over your average keyboard in terms of overall comfort, it still feels like a regular keyboard. That is, it's slightly mushy and generally less tactile given its use of a rubber membrane for the keys instead of the individual switches found in a mechanical model like the Tactile Pro. As anyone who's used both can attest, the difference is immediately noticeable. With a good mechanical keyboard, you don't have to worry about a key press not registering; the keys have more spring to them for a crisper feel and (here's the contentious part for some) they make more noise. It's not a typewriter-level racket, but there's a good chance you'll be frowned upon if you're sharing a desk with someone, or are trying to take notes while on a conference call. It's that potential issue that led Matias to try something different with its latest keyboard -- one that it claims is the world's quietest mechanical keyboard. Did it deliver? Read on to find out. 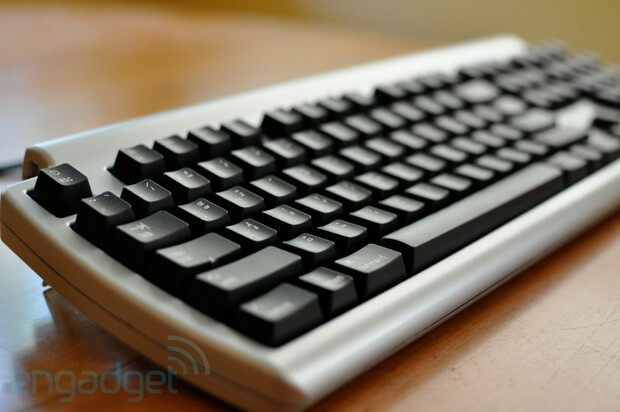 Matias Quiet Pro review: a mechanical keyboard with less clickety-clack originally appeared on Engadget on Thu, 11 Oct 2012 16:00:00 EDT. Please see our terms for use of feeds.